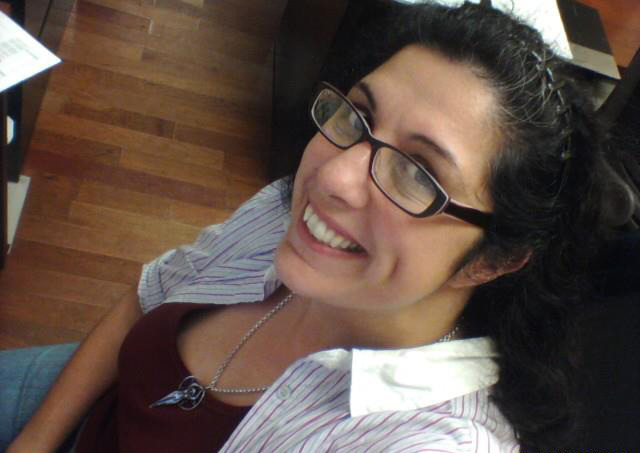 MICHAEL A. VENTRELLA: Today, I am pleased to be interviewing KT Pinto. KT has been writing since she was twelve, finally getting her first book published in 2007. She writes alternate history (The Books of Insanity series) with vampyres and alternate reality (The Sto’s House Presents series) with mutants. She is a modern mythologist and a self-proclaimed ‘fluffy goth’ who would sooner wear pink with sparkles than black velvet. She will be a guest at Balticon in a few weeks (where I also will be a guest). KT will be promoting her latest novel and participating in a book release party. KT, let’s talk first about your latest big news. You received a grant! Tell us about the End of the Rainbow project. KT PINTO: I received a DCA Premier Grant from the Council on the Arts & Humanities for Staten Island (COAHSI), with public funding from the NYC Department of Cultural Affairs to re-write the myths from an alternate lifestyle perspective. I am going to be rewriting myths from Greek, Roman, Norse, Egyptian, and Gaelic cultures. You could read an excerpt of the book here. I will also be doing a reading of this book at Bent Pages, NYC’s only remaining LGBT bookstore (391 Van Duzer Street, Staten Island, New York) on Thursday, October 11, 2012 at 7:00 PM. VENTRELLA: And there’s a raffle, too? PINTO: Yes! The proceeds from this raffle will go towards completing my End of the Rainbow grant project and the winner will be announced at the end of the Staten Island LGBT Festival on June 2nd! There will be 10 different prize “baskets” (the prizes will not actually be presented in baskets), each with a different theme. All of the basket items were donated (it’s great that people are so generous! ), and the baskets range in value from $70 – $220. Details on the baskets can be found here! 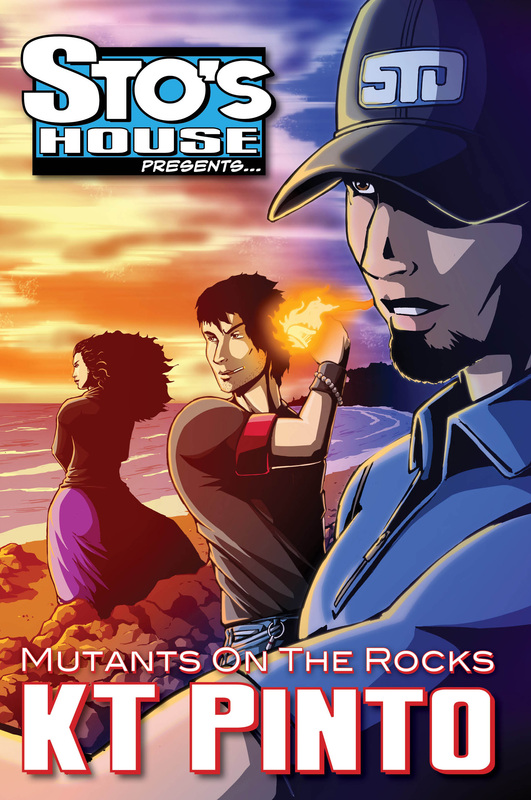 VENTRELLA: MUTANTS ON THE ROCKS is about to be released and is the latest in your “Sto’s House” series. Where did you come up with the idea? PINTO: I had been having a really hard time with my vampyre series, and I realized that being in that dark place all the time wasn’t good for my creativity, so I decided to start writing some more light-hearted stories. I took the idea from an RPG I created called Sto’s House, which is about a bunch of 20-somethings who are mutated by the toxic waste in the Staten Island Dump. They don’t want to save the world, just find the world’s best microbrew. The characters are based on my friend Christopher Mancuso (aka Sto) and the people we used to hang out with at his house when we were in our 20s. I hadn’t planned on it becoming novel-length, but one day I noticed that I had written 10 short stories, and had enough material for a really good (if I do say so myself) novel. VENTRELLA: How has the series been received so far? PINTO: People seem to be having a good time with it. I wasn’t sure how it would be received on Staten Island especially, but people seem to really enjoy the humor and there are enough different characters that readers can relate to one or more of them. VENTRELLA: You’re having a release party at Balticon. Tell us about that! PINTO: I personally am not having the party. Dark Quest Books, who publishes my Sto’s House Presents… series, is having a party highlighting their new releases for the spring. I think four authors are being highlighted there including myself and MUTANTS ON THE ROCKS, which is the second book in the Sto’s House Presents… series. VENTRELLA: Like me, you’re a regular on the east coast convention circuit. What are the advantages of attending these? 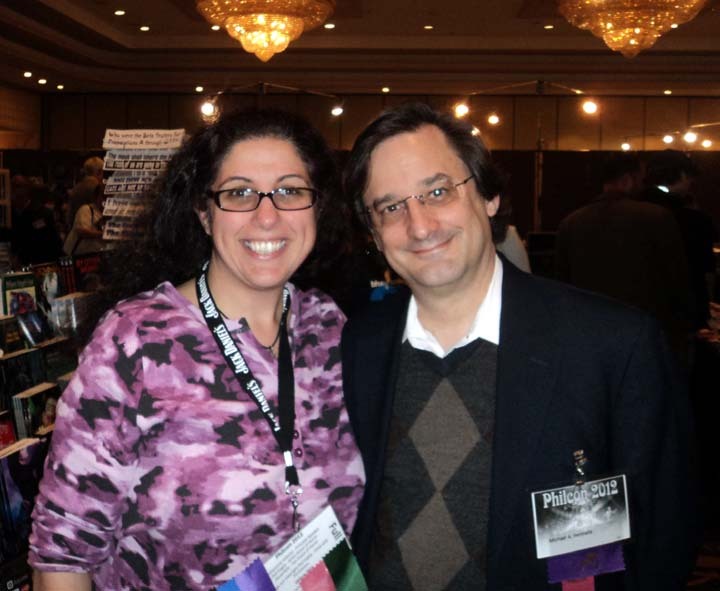 PINTO: Conventions give you a chance to interact with fans as well as getting together with fellow authors and networking with publishers and agents. For me, it’s also good to be on the circuit because I get a chance to see what’s going on in other genres and other disciplines (like costuming and gaming). I actually am starting to cut back on some local conventions and travel to further locations, like Pittsburgh, Pa. and Roanoke Va. because I want to connect with more fans and professionals. VENTRELLA: These days, it takes much more to be a successful author than merely writing a good book. What other efforts have you made to publicize yourself and do you think they have been worth your time? PINTO: I have gotten very involved with my local arts organization, COAHSI, which is a good resource not only for grants, but to meet other local artists, find out about community events, help promote you and your work and even to learn about more mundane information like jobs, insurance and other resources. I’ve been on Live Journal for a really long time, and don’t plan on leaving it any time soon. Not only am I able to write full journal entries, but I can also link it to my facebook and twitter accounts. Facebook used to be a good resource, but it’s gotten so big (I’m up to 1000 friends) and has made so many changes, networking has become difficult. Inanna from By Light Unseen Media – who published MARCO, the third book in my vampyre series – suggested that Goodreads may be a better site for promotions, so I’m feeling my way through that site as well. I also have an account with Constant Contact, which helps me send out a newsletter to a mailing list that I developed by going to conventions. VENTRELLA: What was your first professionally published work? PINTO: My first work was “E-mails 10”, which was a short story published in Nth Degree Magazine (which is now Nthzine on-line). VENTRELLA: You have a LARP background (as do I). How has that led to you writing fiction? PINTO: Although I have been writing since I was 12, LARPing was what helped me create my world and characters of The Books of Insanity series. I used to own a gaming company that ran LARPs around the Hudson Valley, NY and at conventions. I had created a character that was supposed to only be a one-shot ‘big bad’ that the players were supposed to kill in a one-night (possibly two-night) story line. More than a year later, she still existed, because instead of people trying to kill her, they wanted to join forces and build storylines around her. 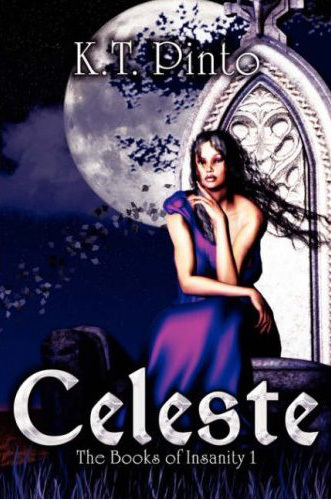 That character’s name was Celeste, and she became the main character in my Books of Insanity series. VENTRELLA: What are the differences between writing for a LARP and writing fiction? PINTO: When writing a storyline for a LARP, you have to be prepared that all of your plans are going to be destroyed within the first five minutes of the game. You have to plan for different levels of gamers and prepare to lead them through a storyline if necessary. Other times your PCs make their story their own and all you have to do is keep track of the rules (in my case, the staff kept track of the rules; I was more a storyline/character person). VENTRELLA: Boy, do I know that feeling. Do you prefer short stories or longer works? PINTO: I used to dislike writing short stories, but the more I do (and the more I get published!) the more I like them. I think I have developed a rhythm to creating a short in a concise manner, unlike when I write a novel. When it comes to my reading, my preference has always been novels. I tend to feel gypped when I read a really good short story and it ends. It always feels like it ended too soon and leaves me wanting more. VENTRELLA: You’ve mostly dealt with mid-sized press (like me!). What are the advantages of dealing with a smaller press? PINTO: Mid-sized presses are good because they’re more open to different ideas and you are able to communicate with the senior staff on a regular basis. You also don’t need an agent in most cases to work with a mid-sized press. 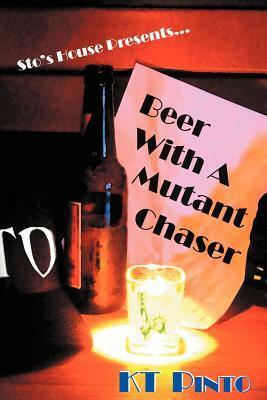 Working with mid-sized presses also gives you a chance to work with and recommend other professionals in different disciples, like editors, artists, typesetters… for example, the cover for MUTANTS ON THE ROCKS was created by Victor Toro, an artist that I recommended to Neal, the publisher of Dark Quest Books. VENTRELLA: Do you advise new authors to consider self-publishing? PINTO: I think self-publishing is good if you have the same knowledge as a publisher would, in order to protect yourself legally and financially. I think self-publishing is good for someone doing a photography or art book, because it’s a way of highlighting your art form. But for me, I think mid-sized presses are a good way to interact with other writers and learn about more writing opportunities that are both with other publishers and with your own company. VENTRELLA: Let’s talk about your writing style. Do you tend to outline heavily or just jump right in? PINTO: It depends on my project. My Books of Insanity series happens over 2000 years, so not only do I have to plan out each book story as I write them, but also had to plan out the arch of the series (I have 13 books planned, but once you hit the world wars, that number can become bigger). The Sto’s House Presents… series, on the other hand, is completely off the cuff. VENTRELLA: What predictions can you make about the future of publishing, given current trends towards e-books and self-publishing? PINTO: I think publishing is always going to stay around; it’s just going to change form. For example, we no longer write on stone or papyrus. I also think with the popularity of ‘nerds’ with all their crazy book reading, along with the eventual (hopefully) return of a good economy, the publishing world will flourish. Just not as much in the brick and mortar form. I also think that with the healing of the economy will also come a rise in vampires again. Lately zombies and steampunk (and sometimes both) have taken over readers’ interests, but eventually it will shift back again. And then my vampyres will rise and take over the world… and my mutants will crack open a beer and enjoy the show. I am really fascinated by the crossover from gamers to writing novels, seems a deep connection there – both drawing from each other. “Modern mythologist” – great term! Thanks for an interesting interview!